‘Open Door’ responds to the unique geographical and social context of Generator Projects in Dundee as part of a group show ‘For The North’. A new (imaginary) entrance was created on the east facing wall to the same design scale as the main entrance to the north side, showing the door slightly ajar. 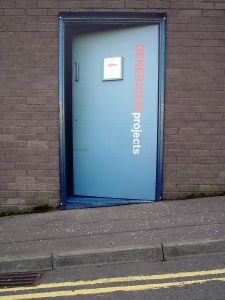 Generator Projects is located in a unit on the Mid-Wynd Industrial Estate and its main audience is an informed art audience which is familiar with the project and its location. From the outside, the building is imposing and access (both physical and psychological) could prove problematic for the unapprised visitor. ‘Open Door’ appears to make the building more accessible and inviting, firstly by providing a new entry point from the main road, and secondly by leaving the door open. The title references open door policy in the business world, a scheme that encourages dialogue between managers and employees. Similarly, ‘Open Door’ encourages new audiences to engage with Generator Projects, except here, the artwork is revealed as a visual trick that may at best ignite curiosity or at worst simply alienate the viewer further.